The CLNX Series makes it simple to replace an existing printer fleet and is easily integrated into a diversified printer environment. The CLNX Series has four standard onboard emulations for replacing Zebra, Datamax, TEC, or Intermec printers. The CLNX will auto detect the commands being sent in the data stream and apply the appropriate emulation. Emulation upgrades can also be easily installed via the USB port on the front of the printer. Standard host interfaces include LAN, USB (type A & B), IEEE 1284, RS-232C, EXT, and Bluetooth, as well as optional wireless LAN support for 802.11 a/b/g/n. The USB port allows users to easily download additional fonts, file caption, firmware, emulations, videos, printer settings, and to drive the use of optional devices. Installation of new printers is easy once the first CLNX is configured. Simply copy the settings, fonts, etc. onto a master USB drive and use it to setup any new printer in seconds. The CLNX is great for multi-national companies or businesses with multiple language requirements. 30 user-selectable display and 47 print languages make label integration, label design and printer support easier than ever, especially when printers are deployed across a global enterprise network. Additionally, the bi-fold cover design makes it easy to install in tight spaces. The overall area required is reduced 54% in width and 27% in height compared to competitive industrial models. On-board video tutorials and intuitive menu navigation mean printer operators no longer have to search for answers. All operators should be properly trained on the use of any new printer, but not every employee is able to retain all of the required information for each activity related to the proper use of the equipment. This is especially true for maintenance or error resolution. If operators have to contact supervisors, refer to product manuals, or contact the manufacturer, these processes can unnecessarily lead to costly downtime. In an industry first, the CLNX Series solves this problem using on-board video assistance. The printer ships pre-loaded with video tutorials for operator guidance and error resolution that can be viewed directly on the printer display. These videos provide instantaneous “self-help” for operators right on the shop floor, while also reducing the time and expense required for training and re-training. With the touch of a button, operators can view a short tutorial video that explains how to address issues such as reloading media, print head and platen maintenance, etc. Users can easily pause, rewind, fast forward and replay these videos to ensure they have followed the correct procedures. The printer’s user interface is a critical component for operational efficiency. Operators must be able to easily navigate the controls and quickly interpret and address error messages. The CLNX Series includes a 3.5-inch, full-color, high-contrast LCD panel with an innovative keypad design layout featuring easy-to-understand universal icons. The icon-driven navigation is similar to that found on a typical mobile phone or laptop, with commonly used icons for printing, application access, system functions, and tools to help guide users through the menu. During navigation the onscreen display will direct the operator using a series of images, numbers, text and symbols that facilitate the setup of network and application settings or printer diagnostics. A bright, color LED indicator which can be seen from across a warehouse alerts users when the printer is operating normally (blue) or if an error condition exists (red). If an error condition is present the CLNX provides an innovative form of communicating and addressing such an error. Operators are guided through steps to clear an error condition and quickly return the printer back to duty. The truly intuitive design streamlines common maintenance procedures. Label printer performance directly affects the ability of a company to achieve its throughput goals and to process shipments on time. If a printer is idle because of a maintenance issue, or is difficult to troubleshoot or repair, or has run out of media, then that offline printer can negatively affect on-time shipment performance and other metrics that negatively affect a company’s bottom line and customer satisfaction. One way to minimize costly downtime is to ensure that routine printer service procedures can be accomplished quickly. The CLNX Series was designed to reduce the number of potential printer errors or print-run failures, and to speed up the processes of routine maintenance. Operators of the CLNX are able to clean and change out print heads and platen rollers quickly, via tool free procedures, thereby minimizing production downtime. Construction of the CLNX Series offers superior durability by way of its metal exterior, die-cast chassis. Its exceptional print quality and accuracy are the result of its print head mechanism, print head heat control and placement of the head in relation to the present position and Label Tension Damper System (LTDS). The ruggedized construction means the printer can withstand harsh environmental conditions, reduce potential breakdowns, and lower the total cost of ownership and operation. Accessing the interior of the printer is also easier. The CLNX features a wide-angle print head opening of 60 degrees, which is nearly twice the opening you would find in other printer models, making it easier to replace label and ribbon rolls, clean or replace the print head, and clean the sensors. By making it easier to access the print head and perform regular maintenance, the CLNX Series printers reduce the amount of time required to perform this maintenance, which in turn, makes it more likely that operators will keep the print head clean and operational. Tool free head pressure adjustment provides easy set up and modifications for a variety of label widths and substrates, while a label guide and damper system (LTDS) provides consistent resistance to the media, reducing printer jams and improving print quality, as well as precise label placement. A large media window makes it easy to view label and ribbon supplies. The straight through label route is clearly visible and accessible, which helps avoid wasted time associated with replenishing consumables. The internal roll label holder includes an easy slide guide that can extend the standard roll use from 8-inch O.D. to a 10-inch label roll. The new thermal transfer ink-ribbon rewind with an oversized core and coreless capabilities provides stable rotating torque to reduce ribbon wrinkles. An optional internal rewinder is also available, providing liner take up when the optional dispenser is used. An idle label printer not only reduces operator productivity, it can cost a company time and money by degrading throughput and on-time labeling requirements. In some facilities, the loss of a single printer can take down an entire line of production. 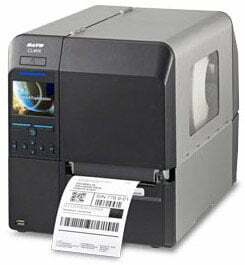 Label printers that can be quickly and easily serviced and maintained can reduce unnecessary and costly downtime. The SATO CLNX Series eliminates common maintenance issues with its durable construction, wide-angle print head access, tool free print head and platen adjustment/ replacement procedures, and reliable print quality. The printer’s innovative color display provides access to video tutorials that guide operators through media loading, parts replacement and help operators more quickly address error conditions. The CLNX Series provides an intuitive, global printing solution for users in demanding supply chain, automotive, retail, manufacturing, healthcare, transportation and logistics applications.